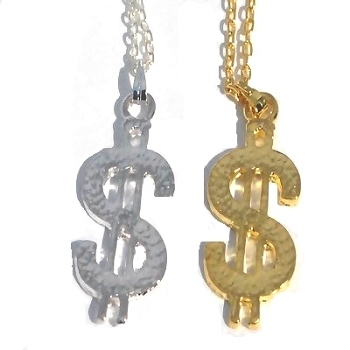 A dozen Cha-Ching Dollar Sign $ Chain Necklace Pendants. 1 pack has 12 Neckchains. The necklaces are about 19 1/4 inches. In the dozen pack thre are 6 silvertone dollar signs with silvertone chains and 6 goldtone dollar signs with goldtone chains. The dollar sign pendant is about 1 3/8 inches. All measurements are approximate.